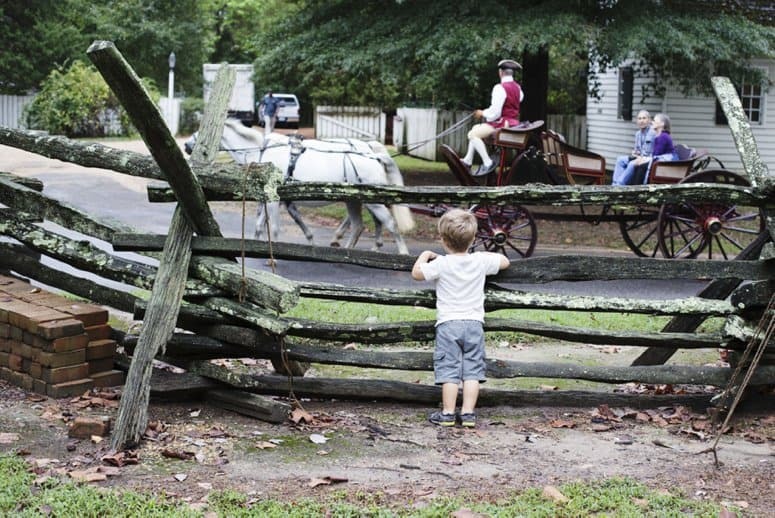 Colonial Williamsburg’s twice annual homeschool days are a wonderful way to combine a fabulous family vacation with hands-on-learning through living history. 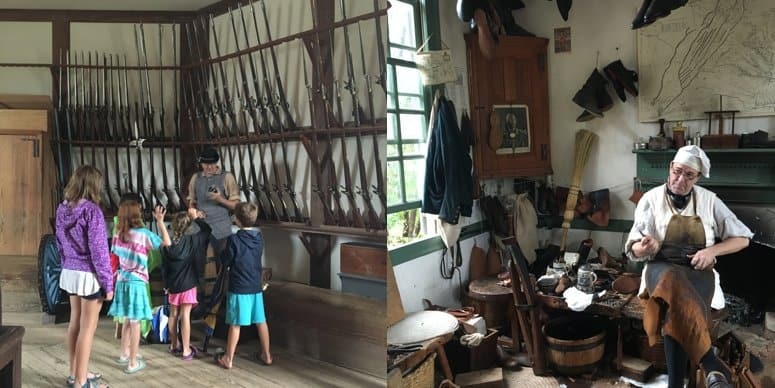 This September my family had a wonderful experience at Williamsburg, so today I’m sharing some tips and tricks to help you make the best of Homeschool Days at Colonial Williamsburg. 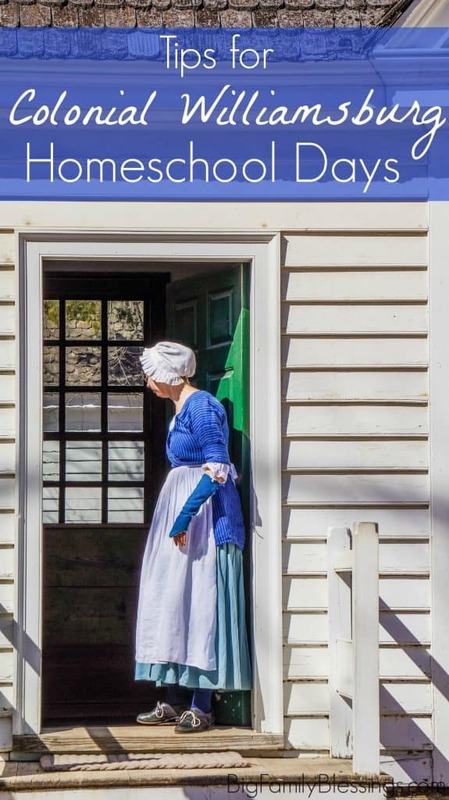 Colonial Williamsburg hosts homeschool days twice a year, for two weeks each. Plan and reserve your vacation as early as possible. 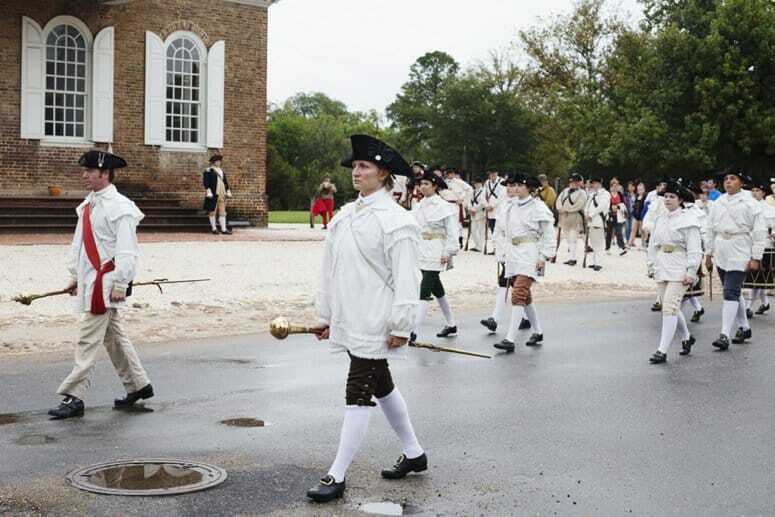 If you plan to take homeschool classes, in addition to exploring the Revolutionary City on your own, plan to purchase the two day Williamsburg ticket. The two day ticket is a great value! While you could potentially see the majority of the city with a one day pass, adding classes will make it nearly impossible. Each exhibit in the city has a costumed interpreter who will explain the exhibit and answer questions with amazing knowledge. You are not going to want to rush through the city! If you choose to take special homeschool classes, each class has a limited number of seats available. You’ll want to call for reservations ASAP. When signing up for classes, remember the colonial city is quite large. Be sure to read class descriptions, as most classes are an hour long. Leave 30 minutes to an hour free between classes to walk the distance to the next class, snack, and take a restroom break without a mad dash across the city. Download the Colonial Williamsburg Explorer App. You’ll have the colonial city map at your finger tips. This comes in handy, especially if you have a young child who needs a bathroom break immediately! The app surely saved our day when the sudden need for a restroom hit! The app also has a list of the day’s activities and events, which is very helpful when mapping your day. Several exhibits in Colonial Williamsburg are only open a few days a week, or for one half of the day. Use the Explorer app to ensure you don’t miss an exhibit you really want to see! We didn’t realize that the Bindery and Printing Office, though next to one another, are only open for different halves of the day. If I’d checked the clearly listed times, I would have planned accordingly. You can also check the “Week at a Glance” under the “plan” tab on Colonial Williamsburg’s website. 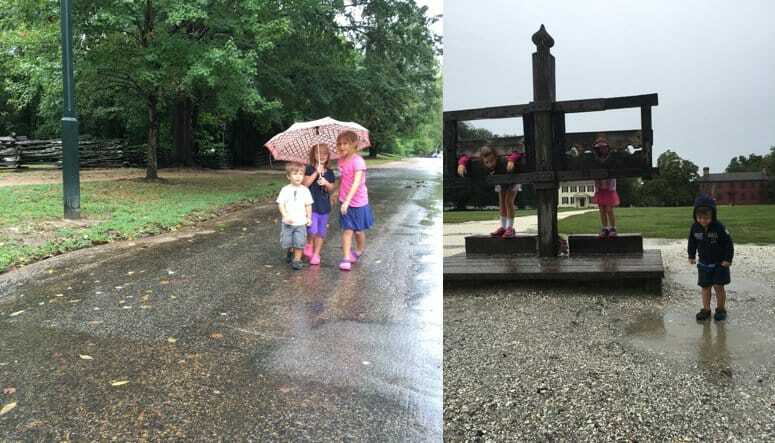 Colonial Williamsburg is a wonderful place to vacation and learn with your family. Especially during Homeschool Days when admission is greatly discounted for homeschoolers, and the city offers many extra classes perfect for homeschooling families. Let’s talk about what you will want to pack, where you should eat, and things you won’t want to miss while visiting Colonial Williamsburg. When packing for Colonial Williamsburg, remember the Revolutionary City is not built for strollers. If you can leave your stroller at home, maneuvering around the city will be much easier. Consider packing necessities in a backpack. If you have a large family, a small backpack for each person containing snacks and water will lighten the load. If you must use a stroller, it will be necessary to leave it outside most exhibits. Pack a small bag with valuables to carry in each exhibit when leaving the stroller behind. If your family wishes to wear colonial costumes, plan ahead. Renting costumes for one day at Williamsburg costs $25 per person. Costumes are available for purchase, but are also quite expensive. Most visitors will not be in costume, so do not feel a costume is necessary. In lieu of a full costume, choose a small accessory such as a mob cap or straw hat with ribbon for girls, or colonial hat for boys. Speaking of clothing, pack extra clothes in your suitcases. By days end, your family will be covered in dust and dirt (or mud if it rains). You will want to change clothes before heading to dinner! Wear comfortable shoes. These will get filthy also, so pack with that in mind. Check the weather forecast, and pack accordingly. You will spend much time outdoors. A jacket for cool weather and rain gear in case of ominous weather, are mandatory. If it rains, ponchos at the shops sellout, and they are very expensive. While there are several restaurants in the colonial city, the food is quite expensive. Plan accordingly, or plan to eat outside of the colonial city for meals. The free Colonial Williamsburg bus shuttles are convenient and frequent. It’s a short ride from the visitor center to the colonial city. Perhaps leave a cooler with lunch in your car, and return to the visitor center parking lot to eat. Since most educational exhibits close at 5pm, consider eating a big breakfast, packing heavy snacks in your backpack for the day, then eating an early dinner right after leaving Colonial Williamsburg at 5pm. Several area restaurants have free or reduced kids’ meals on weeknights. Outside food is allowed in the outdoor spaces of Colonial Williamsburg. On a pretty day, you’ll find many beautiful spots to stop for a snack or lunch. Do not forget to pack water for each day! Vending machines are available, however pricey. Do not miss “On to Yorktown and to Victory” behind the courthouse at the day’s close. General Washington addresses the town to rally support to fight the British, the militia marches and fires weapons, and the fife and drum corps marches to lead the way. 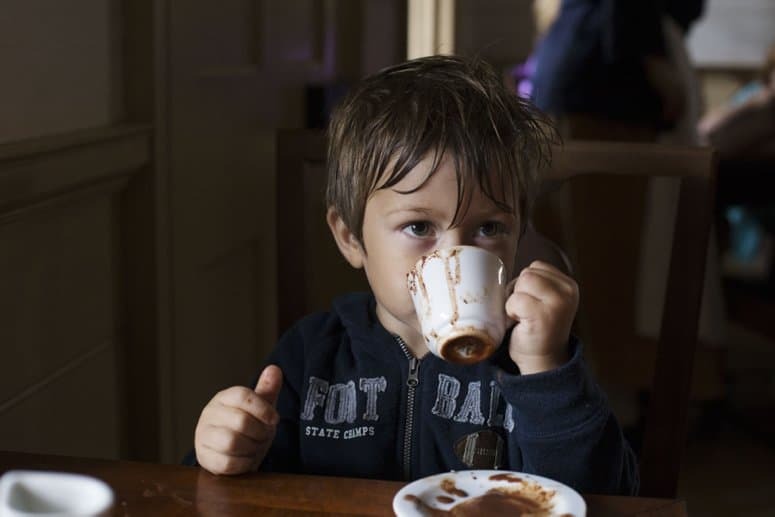 Another favorite is Charlton’s Coffeehouse where you experience and learn the manners of dining in “polite company” while sampling colonial hot chocolate, coffee, or tea. Up to 15 people enter the coffeehouse every 15 minutes. Encourage your children to ask questions of any costumed interpreter they meet in the city. The interpreters engage the children as if they were part of colonial times as they answer questions. 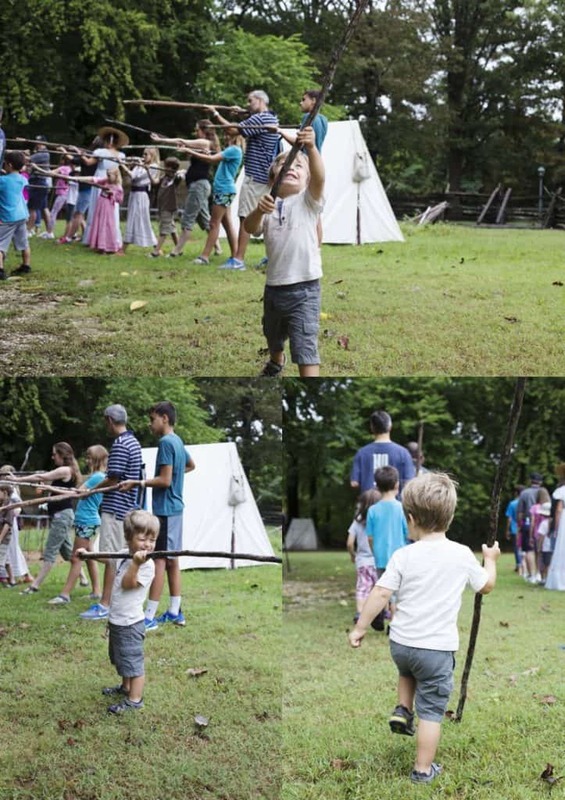 This is where history comes to life in the eyes of children. After visiting Colonial Williamsburg, I can’t wait to plan more historical travel with my children. Do you love hands on learning through field trips as much as I do? Check out this amazing list of 100 United States Historic Sites to See While Homeschooling list as you plan historical field trips for your homeschool. I can’t wait to check off all 100 with my children! So random, but my friend forwarded me this post after spotting my husband and son in the photos of the military training. They are in the background shooting their "stick muskets" behind your son. So funny! It was our first time there and we had a great visit as well. That is too cool! What a small world.